Learn more about the combatants who debate current local trends and hot political topics, who agree to disagree every week on Donnybrook (Thursdays, 7:00 p.m.; Saturdays 1:00 a.m.) and Donnybrook...Your Turn (Thursday 7:30 p.m.; Saturdays, 1:30 a.m.). For comments about Donnybrook, email letters@ketc.org. Charles Brennan is in charge of radio station KMOX's top-rated weekday mid-mornings. Brennan has been voted St. Louis' favorite talk show host four times in the Readers Polls of the Riverfront Times. In 1998, he was named Media Person of the Year by the St. Louis Press Club. Brennan was named one of America's top 25 "most influential radio talk show hosts" in USA Today. Brennan has worked at KMOX since 1988, after working in Boston radio beginning in 1982. He is a native of Cleveland, Ohio and a graduate of Boston College. Brennan assumed the role of host in January 2010. Martin Duggan gave Ray Hartmann his first newspaper job as a copy boy at the St. Louis Globe-Democrat. Surprised? Don't be. Despite the chasm in their political views, the two seeming adversaries know friendship isn't limited by such boundaries. Hartmann founded The Riverfront Times in 1977 and with partner Mark Vittert, sold it in 1998. Today, Hartmann Publishing also owns St. Louis Magazine. Hartmann is a native of St. Louis and a graduate of the University of Missouri-Columbia. Letters to Channel 9 about Bill McClellan comment as much about his clothing as about his political opinions. Whether or not viewers regard McClellan as a sartorial icon, his style is as firmly entrenched as his love for his hometown baseball team, the Chicago Cubs. He joined the St. Louis Post-Dispatch in 1980, shortly after moving to St. Louis. He and his wife, a graduate of Washington University's dental school, have been married since December 29, 1979, and have two children. Wendy Wiese has anchored newscasts, interviewed local, state and national newsmakers, narrated award-winning documentaries, and has been a fixture in St. Louis radio for more than 20 years. A recipient of Ohio State Radio and Television News Directors and Missouri Broadcasters Association awards and a graduate of Visitation High School and Fontbonne College, Wendy is active with Catholic Charities and a board member of the Mathews-Dickey Boys and Girls Club. She lives in Chesterfield with husband Chris and daughters Kate and Maggie. Alvin Reid is lead sports columnist for the Globe-Democrat, the latest stop in a 26-year journalism career that has taken him from Danville, Ill, to Little Rock, Ark., to Lansing, Mich., to Washington, D.C. and finally back to his hometown of St. Louis. Reid spent 12 years at the St. Louis American, where he twice was honored by the Missouri Press Association as Best Sports Columnist. He also is a member of the 101 ESPN radio staff and in January 2010 became a regular member of Donnybrook. The show that gives new meaning to the word "debate." See what happens when five quick-witted, highly opinionated St. Louis journalists disagree on tough topics. This is not another dry, tame talk show. On Donnybrook, the issues are hot and so is the discussion. It's a high-energy, no-holds-barred debate on the week's news topics. With tongue-in-cheek, Donnybrook's subtitle is "polite conversation on the issues." With host Charlie Brennan, the conversation is highly opinionated and not always "polite." 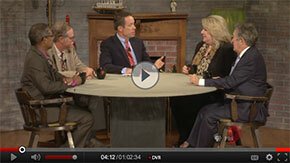 The panel of regulars tackles tough issues and controversial subjects. The opinions are well-informed and widely divergent. Tune in Thursdays at 7:00 p.m., followed by Donnybrook...Your Turn at 7:30 p.m. on Nine PBS. Watch the Donnybrook & Your Turn live stream on Thursdays at 7:00 p.m.
Join the conversation on Twitter using hashtag #DonnybrookSTL. Call 1-800-221-5382 to ask a question during Donnybrook...Your Turn. Ever want to ask the Donnybrookers a question, in person? Now is your chance – become a member and receive tickets to the next DonnyBash! Live at the Sheldon Concert Hall, September 26, 2019. Donnybrook is now available as a podcast on major podcast networks including iTunes, Spotify, Google Play, and TuneIn. Search for "Donnybrook" using your favorite podcast app!